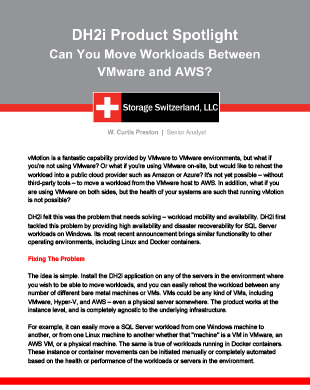 DH2i Product Spotlight: Can You Move Workloads Between VMware and AWS? As the heterogeneity of IT environments increase around the globe, management is becoming more complex and more time-consuming. Whether it be on the primary site alone, or a remote disaster recovery site, most organizations simultaneously run environments containing different underlying infrastructure. The lack of availability and portability within these environments was a problem that DH2i initially set out to solve for SQL Server, and has now branched out to Linux and Docker as well.